When Dylan Ledbetter lined up in the middle of Eastern Washington’s defensive line last season, he was often outsized by the behemoths in front of him. 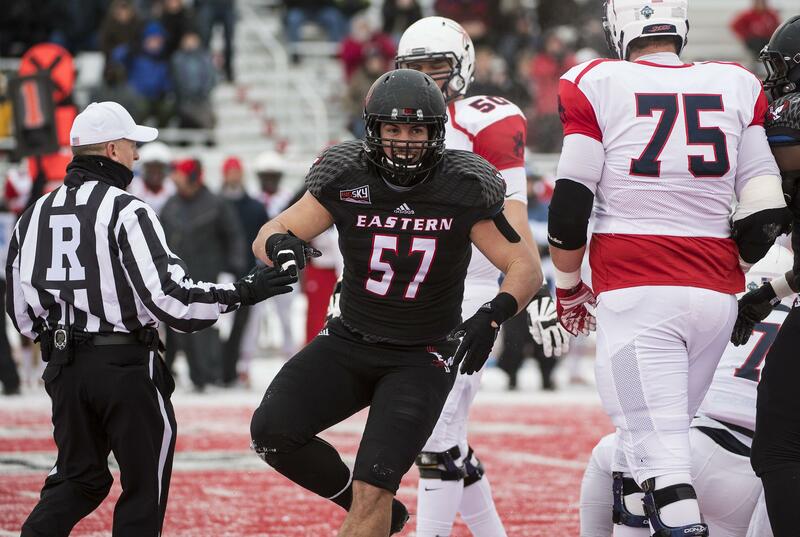 Ledbetter, who weighed just over 250 pounds, slid to nose tackle when All-Big Sky Conference talent Jay-Tee Tiuli was sidelined with a season-ending shoulder injury. His speed off the ball led to 45 tackles and four sacks, but it wasn’t his natural position. Tiuli is back in the middle and now Ledbetter is at home: defensive tackle, the position he was recruited to play out of Seattle’s O’Dea High School. “It’s nice,” said Ledbetter, who is now listed at 6-foot-3, 270 pounds. “It was obviously different me for and Jonah (Jordan) out there, two not-very-large defensive tackles. Now we have Jay-Tee, who commands two (blockers) every play. It showed in the Eagles’ 31-26 win at Northern Arizona on Saturday, as Ledbetter made a team-high seven tackles, blocked a field goal and had a key sack late in the fourth quarter. The Eagles’ defensive front limited the Lumberjacks to 126 yards rushing on 41 carries and had five sacks, an act it hopes to repeat on Saturday when EWU (2-0) travels to Washington State (2-0). Kickoff is scheduled for 5 p.m. The Cougars’ offensive line has yet to yield a sack, giving quarterback Gardner Minshew ample time to find his stable of dangerous wide receivers. WSU ranks eighth in passing (369.5 yards per game) at the FBS level. His dad, a former Washington State linebacker, will be the crowd to watch – and he won’t be wearing crimson. He had eight tackles and a sack in the 1988 Aloha Bowl. Ledbetter’s first collegiate game was the Eagles’ 45-42 upset of Washington State in Pullman in 2016. Other Eagles with major WSU ties include defensive back Cole Karstetter, whose brother Jared Karstetter was a wide receiver for the Cougars. Offensive lineman Matt Meyer was on WSU’s 2013 team. And EWU wide receivers coach Jay Dumas hauled in 96 passes for 920 yards in his career at WSU from 1992-96. Published: Sept. 11, 2018, 8:41 p.m. Updated: Sept. 11, 2018, 9:29 p.m.